"This war might last longer than me…" Film Movement has debuted a trailer for the indie drama Men Go to Battle, about the story of two brothers during the American Civil War. This is kind of the opposite of Free State of Jones, another Civil War movie due this year, with more of a mumblecore vibe and it even has a darkly comedic side - though that's hard to tell. The cast includes Timothy Morton, Charlotte Arnold, Steve Coulter, Samantha Jacober, Rachel Korine, David Maloney, Emily Cass McDonnell. The film follows two brothers trying to keep their crumbling estate together outside a Kentucky town. Have fun. Official synopsis: Kentucky, 1861. Francis and Henry Mellon depend on each other to keep their unkempt estate afloat as winter encroaches. After Francis takes a casual fight too far, Henry ventures off in the night, leaving each of them to struggle through the wartime on their own. Men Go to Battle is directed by newcomer Zachary Treitz, making his feature directing debut after a few other short films previously. The screenplay is written by Zachary Treitz & Kate Lyn Sheil. The film won Treitz the "Emerging Filmmaker Award" at the Indie Memphis Film Festival last year, and the film also played at AFI Fest. 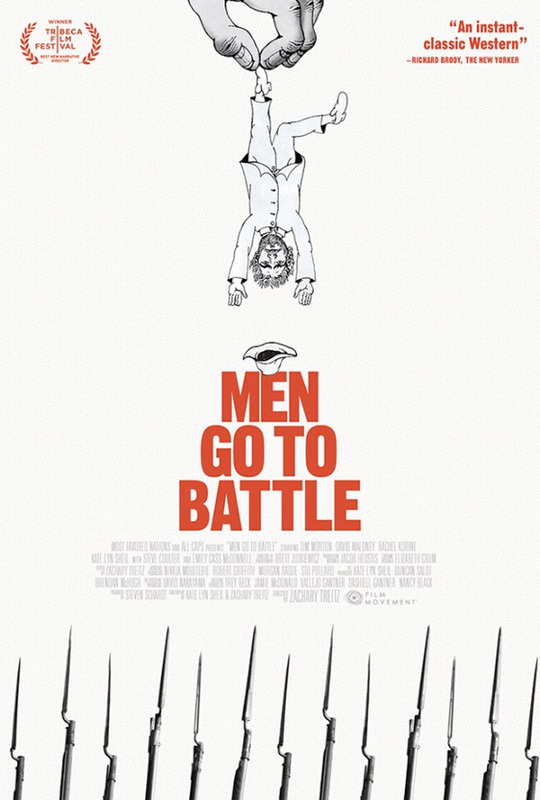 Film Movement will release Men Go to Battle in theaters starting July 8th in the middle of the summer. Want to see this? I already know I am going to like this movie. Saw this last summer at Rooftop Films, and I strongly recommend it. The acting is top-notch, the cinematography and editing allow you to immerse yourself in the small scale of the story, and the way the writing focuses on the class tensions of the Civil War is innovative for the genre.